A Berlin Cabinet Plate. 19th.Century. Another very well painted cabinet plate made at the Berlin factory in the second half of the 19th.Century. Painted in polychrome enamels with a ornithological subject of two colourful birds perched in a tree. The cavetto painted with insects. The rim of the plate pierced with overlapping gothic arches highlighted in gilding. Marked with underglaze blue Berlin mark and impressed/incised marks Measures 23.8cm. (inches) diameter. Very good, no damage and very little wear. A Meissen porcelain plate dating from the late 19th. or possibly early 20th. Century. Decorated with a view of the town of Meissen in the 18th./19th. Century. Named beneath. The plate marked with underglaze blue crossed swords and impressed numerals. Measures 21.5cm. diameter. Good. No damage or restoration. 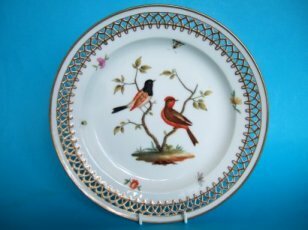 A German porcelain plate, dating from the late 18th.Century, c.1780. Possibly made at Volkstedt or Ludwigsberg. 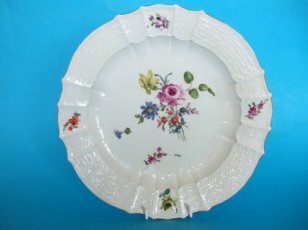 Moulded with basketweave to the fluted and scalloped rim and painted with a well painted flower group and scattered sprigs in typical German style. The plate has no factory mark just an impressed number. Measures 24cm. (9.45 inches) diameter. Quite good. There are some chips to the footrim and a little wear the the enamels and rim gilding. 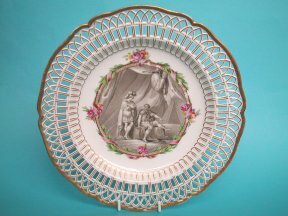 A Berlin Pierced Rim Plate. 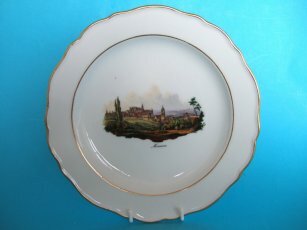 A superbly painted Berlin porcelain plate dating from the last quarter of the 18th.Century. Decorated in grey, in neoclassical style with a scene of two Greek or Roman warriors conversing in the interior of a tent in an encampment. The subject probably copied from a painting or engraving. The pierced rim heightened with gilding. Measures 25cm. diameter. Good, no serious damage but there is a small area of the rim that has be re-gilded, presumable due to a repaired chip. There is also a little flaking to the gilding. There are no cracks.